A developer has been attached a new $50 million project in the northern Adelaide council region of Playford which will see the construction of a brand new hotel amid a revitalised Grenville Centre precinct in the council’s main CBD area at Elizabeth. Expected to be seven storeys in height, the forthcoming hotel is expected to be a 4.5-star offering up to 260 rooms. Expected guests will be businesspeople in town on business with council and other businesses, fans visiting for nearby sporting events and the general leisure travelling public. Design features will see the hotel built with a rooftop sports bar, fitness centre, swimming pool, function room and at least two restaurants and bars for guests to enjoy. It will be situated next to Playford Arena and overlook the adjacent Prince George Plaza. At this stage, construction is due to commence in January next year and potentially open at the end of the same year. The revitalised area comes as part of a major financial injection into the area following the closure of the Holden construction plant in October last year. City of Playford Mayor Glenn Docherty said the plan is generating significant buzz among the market. “We are positioning our CBD as the service point for all northern parts of our State. 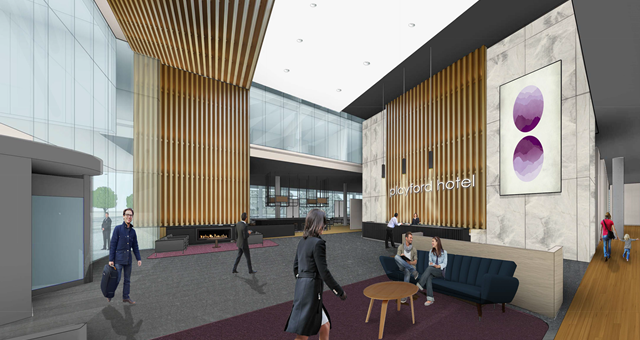 This hotel, along with the Playford Arena, are significant milestones toward this path,” Mayor Docherty said. Smart City infrastructure will be incorporated into the site, offering visitors to the region internet speeds significantly faster than NBN. Around the hotel site will be low-energy LED street lighting and access to a number of charging stations for electric vehicles. No hotel management brands have been invited to apply to brand the hotel at this stage.